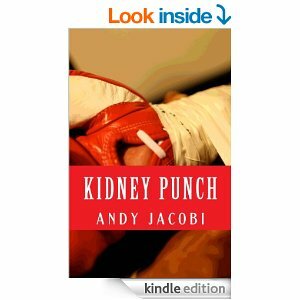 My April book of the month is the dark, muscular Kidney Punch by first-time author Andy Jacobi. The book was winner of the White House Press First Novel awards and it is an utterly original work. At times painfully moving, at times exhilarating, the prose is tightly wrought, the characters well drawn, and the fight scenes are breathtaking. “Shane Jackett is a fighter, born and bred. He’s had to fight for everything, all his life. It is all he knows how to do. But when his family is threatened to be torn apart for a second time, Shane faces a terrible choice. Unflinching in its honesty, and often brutal in its outlook, ‘Kidney Punch’ is the story of Shane’s coming to terms with his own masculinity in a world where there are a severe lack of adequate role models. It’s a story about men escaping from responsibility, through drinking, fighting, running away. It’s about trying to do the right thing when things get so bad it is not even clear what the right thing is. “Literary life began at 40 for Andy Jacobi. They say everyone has a book in them, but until Andy had reached middle-age that was where he believed that book would be forced to remain. Andy served his writing apprenticeship at the Ravenscar Mount Writing School, where he penned a number of short fictions, some of which were published. Having graduated, he began work on his magnum opus, Kidney Punch. The novel would eventually win White House Press’s inaugural First Novel Award. Unless the author is highly original, unless the characters are interesting and engaging, unless the stories immediately hook the reader by the time a series of novels reaches its tenth installment it might have begun to seem stale. Formulaic. Samey. By the same token, if the author is at the top of his or her game, if the characters still have the capacity to intrigue and confound expectation, if the stories don’t just hook the reader but club them on the head until they sit up and take notice, by the time a series of novels reaches its tenth installment, it might truly fly. 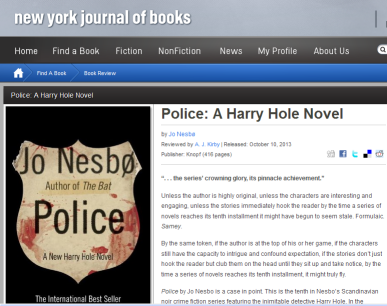 Police by Jo Nesbo is a case in point. This is the tenth in Nesbo’s Scandinavian noir crime fiction series featuring the inimitable detective Harry Hole. In the previous novels, Mr. Nesbo has already built one hell of a foundation and here he provides the series’ crowning glory, its pinnacle achievement. This is, quite simply, a must-read book. The novel quickly hooks the reader into the narrative and then continues to hold our attention as we roll with it, as though on a downhill slope, heading inevitably, inexorably, toward its devastating conclusion. 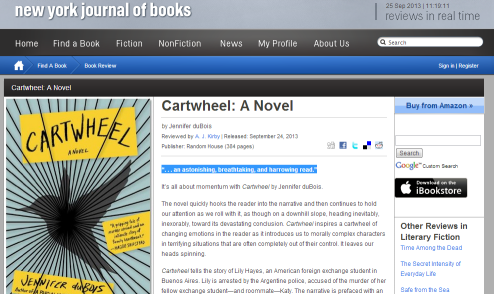 Cartwheel inspires a cartwheel of changing emotions in the reader as it introduces us to morally complex characters in terrifying situations that are often completely out of their control. It leaves our heads spinning. 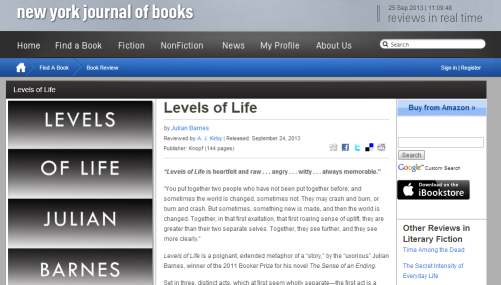 Levels of Life is a poignant, extended metaphor of a “story,” by the “uxorious” Julian Barnes, winner of the 2011 Booker Prize for his novel The Sense of an Ending. Set in three, distinct acts, which at first seem wholly separate—the first act is a historical piece regarding the “balloonatics,” “the new Argonauts,” who engaged in hot air ballooning in 19th century Europe; the second homes in on a (doomed) romance between one of the principal “balloonatics” and the actress Sarah Bernardt; and the third is a moving elegy to Barnes’ wife, the literary agent Pat Kavanagh, who died in 2008—but which together eventually come to form a “nice pattern” of a narrative. 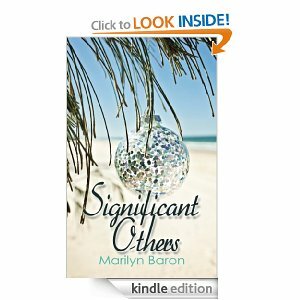 Marilyn Baron’s compelling new novel is a grandstanding celebration of love in all its forms. Here, there is enough love for everyone, no matter how old they are, no matter how much they’ve given up on discovering love, a special one, for themselves. 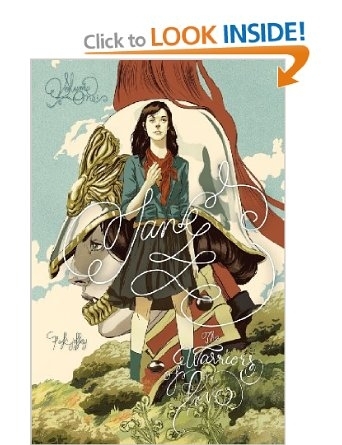 The plotting is intricate, the characters are engaging, the dialogue sparkling and witty. Indeed, after completing the novel, my first impression was that the book had something of the Shakespearean romance about it. Here we have an old love lost and found; we have miraculous twists of fate; we have sinister forces trying to stop love – the Seniors Against Sin. We have confusion and mixed motivations – those carefully managed plot twists I mentioned above – but, as in the best Shakespearean romances, all is resolved at the end. In essence, this is a love story saga which spans three generations of the same family. We meet the matriarch, Dee Dee Palladino, who, on the anniversary of her husband’s death discovers a ‘Jesus Tree’ (in the manner that some people see Moses in a slice of toast) in the bark of a tree in her retirement village in Florida. Honey, her “workaholic” daughter (though she won’t admit it) hears of Dee Dee’s discovery and travels out from Atlanta, worried her mom might be ‘losing it’. Honey’s marriage is on the rocks: she suspects her husband Marc of conducting a sordid affair with his temp, and indeed, discovers what she believes to be the photographic proof. Then, finally, there is Honey’s daughter, Hannah. Hannah is a 21-year-old student. She is in a relationship with a Mormon boy (though his Facebook relationship status doesn’t confirm this) with commitment issues. The main players are ably supported by a colourful supporting cast including Dee Dee’s sister Helene; Dee Dee’s son (and Honey’s half-brother) Donny, a baseball star, and Daniel, a mysterious, tall, dark and handsome stranger whose presence snags with something in Dee Dee’s memory. Has she, perhaps, met Daniel before? Is he, maybe, some blast from the past who can help restore order to her life? There are plenty of family problems to overcome within the narrative, not least of which is the fact that the family business – real estate – has been lined up to be sold. They are on a deadline. But Honey loves working for the real estate company. It is her life. Dee Dee, by contrast, wants to sell the company because she wants a life. This is a subtly magnificent read. It is poignant at times – witness the war letters; funny – Honey’s sardonic wit allows the reader a unique perspective on events – I particularly enjoyed her discussions with her best friend Vicky, she of the nightmare boss who has her de-seeding grapes for her; discursive – it positions itself well to discuss issues such as work-life balance, for example; even postmodern at times – the story offers a twist on the fairy tale – at one point Honey rescues a frog from a swimming pool, and thinks about kissing it to awaken her handsome prince. But the main idea it posits is the fact there is a significant other for all of us, no matter how old we are. As long as we give love a chance. As long as we don’t drown it – muffle it out with all the bleeps and ringtones of modern life (Baron is excellent on Honey’s addiction to her BlackBerry). As long as we are prepared to put ourselves on the line for it.